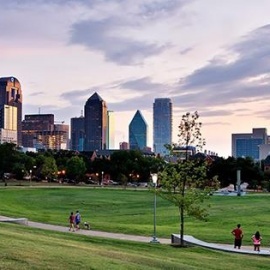 Notably the more upscale part of Dallas, Uptown is home to a close-knit neighborhood, the most antique and variety shops in the city, as well as fancy entertainment all the while maintaining that ?nearby? feeling that keeps many residents comfortable not owning cars. Uptown is also a very busy and community involved area. Events like locally promoting festivals, charity fundraisers and art exhibits are frequent throughout the entire year. Not to mention, there is also a district public improvement board that constantly works together to maintain Uptown?s reputation as well as continue to improve it. Interesting visual arts galleries visitors should make sure to stop and see include Uncommon Market, Inc., The Dallas Opera, Galleria Pierra and The Dallas Institute of Humanities and Culture. If you get hungry, there are countless varieties of foods and drinks that can be found throughout the district. However, more popular places are the Tribeca Restaurant and Lounge, the Cru Wine Bar, Arcodoro and Pomodoro, and of course, Uptown Bar and Grill. This friendly neighborhood is full of relaxing and interesting things to do, so definitely don?t skip it! As always with our "Meet Ups" there are no panels, no dress code and no expectations. We will talk and build community, let's connect!